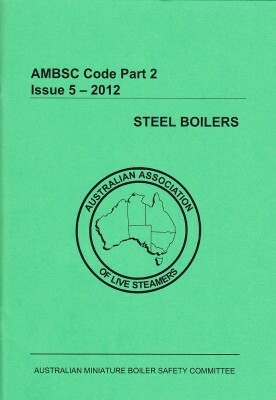 The AALS Boiler Codes and Codes of Practice have been developed by the Australian Association of Live Steamers (AALS) are are accepted by relevant authorities Australia wide, and are used as a reference or defacto standard by many others worldwide. 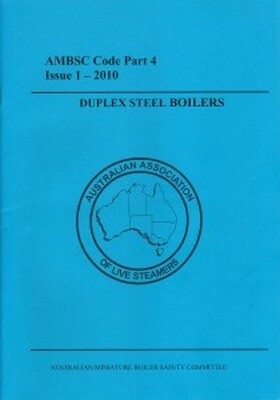 These boiler codes were developed and published by the Australian Miniature Boiler Safety Committee (AMBSC), and cover miniature boilers for steam powered models. There are different codes for different boiler types and sizes. 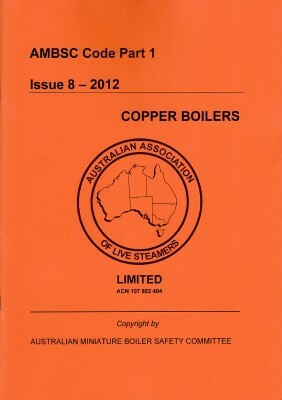 (Copper Boilers) A4 Soft cover. Covers copper boilers up to 25 litres capacity and <700kPa (100psi), and <203mm (8") diameter. (Steel Boilers) A4 Soft cover. 68 pages. Covers steel boilers up to 50 litres capacity and <700kPa (100psi), and <356mm (14") diameter. 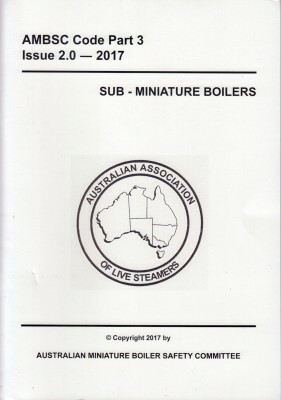 (Sub-miniature Boilers) A4 Soft cover. 20 pages. Covers Sub-miniature copper boilers up to 1.0 litres capacity and <520kPa (75psi), and <63.5mm (2.5") diameter. (Duplex Steel Boilers) A4 Soft cover. 48 pages. Covers duplex steel boilers up to 50 litres capacity and <700kPa (100psi), and <325mm (12.8") diameter. Also applicable for air receivers <25 litres capacity. 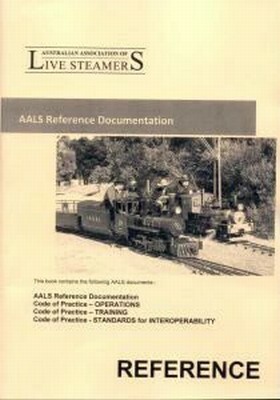 The Codes of Practice have been developed by the AALS Australian Live Steamers Safety Committee. A4 Soft cover book. 80 pages. Includes the AALS Reference document, plus the Codes of Practice for Operations, Training, and Interoperability Standards all conveniently bound into a single volume. Covers wheel, track & coupling standards, braking requirements, operating procedures, lineside clearances, operator and other personnel, training, registration, incident reporting etc. Download a copy of the order form here in PDF format and post with payment. Shipping address: Remember to enter the shipping address for your order during the checkout process where it says "Billing address". 185 Text and photos Copyright © 2006-2019 SMEX, All rights reserved.